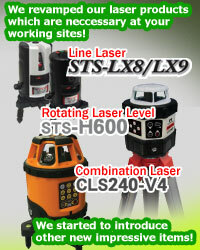 Green laser beam is five times brighter than red laser beam. Green color has high visibility. 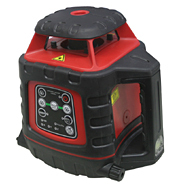 This instrument conforms to IP66 for water and dustproof. It is protected from rain or dust. Due to Vibration Resistance, this instrument can bear being used in hard working condition. For the horizontal and vertical, only place the instrument(±5°). It is not necessary to use Spirit Level or Adjusting Screw. Using included detector, operating area will be widen to about 600m in diameter. This Anti-Vibration function makes the instrument keep leveling continuously without stopping rotation every time it feels slight vibration. In addition to the manual mode which enables slope setting keeping rotator rotating without leveling, it also has slope mode which can be used with safety mode at the same time. Furthermore, it newly adopted pipe laser mode which enabled slope setting at laying the instrument. AC Adaptor and Rechargeable Battery are options. Note: It does not work only with AC Adaptor. 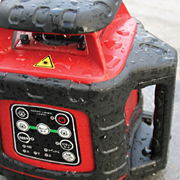 Rechargeable battery(BTVH10) is necessary even when operating with AC100V. Note: for using this rechargeable battery, AC Adaptor (SAC-60) is necessary. Power supply Alkaline C dry cell battery x 4 pcs. Safety mode Safety Mode Lamp blinks, Rotation stops, Laser beam blinks.